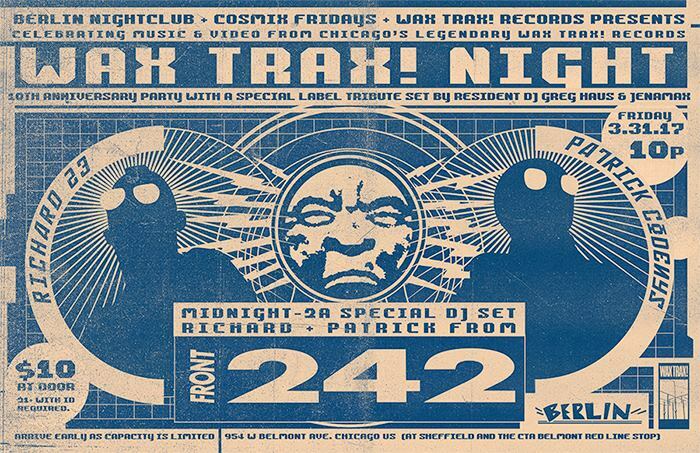 Celebrating music & video from Chicago’s legendary Wax Trax! records with FRONT 242 (Richard 23 & Patrick Codenys DJ Set) at Midnight and a special label tribute set by resident DJ Greg Haus & JenaMax. $10 at the door. (Arrive early as capacity is limited). This DJ event is in conjunction with the WAX TRAX! Documentary weekend at the Chicago’s Vic Theatre Saturday April, 1 2017. In addition to being featured in the WAX TRAX! documentary, Richard 23 & Patrick Codenys will be appearing live at the Vic Theatre for a special panel discussion related to the independent WAX TRAX! store, label and founders Jim Nash and Dannie Flesher. © 2018 Wax Trax! Films. All rights reserved.